Experience counts, but most of all you’ve got to have passion, responsibility and pride in what you do. You will be challenged, pushed and asked to achieve great results. You will only accept the best performance from yourself. You will have an excellent track record in implementing ISO 9001, ISO14001 and OHSAS 18001 standards. You will expect all of your clients to achieve perfect audits. You will be a strong multi-tasker able to manage several clients and projects in parallel. This role involves regular travel within Ireland, so you will have a full clean driving license and access to your own vehicle. And us? 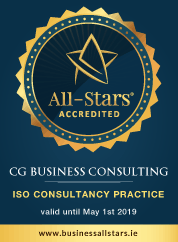 We’re CG Business Consulting…one of Ireland’s leading ISO management consultancy firms. We have provided superior ISO consultancy services since 2008 and have assisted hundreds of businesses to achieve certification to international standards. We have an approach to ISO certification that is simple, innovative and fast. We invest in the quality of our systems, knowledge and consultants so that we can guarantee our clients that they will achieve ISO certification in the shortest possible time. We’re looking for a superb QEHS Consultant to fulfill the growing demand for our services throughout Ireland. Reporting to the Operations Manager, you will receive full training in all our methods and systems. This role will particularly suit a professional, client-focused consultant who thrives on getting things done right and on time. The QEHS Consultant is responsible for the establishment, documentation, training and auditing of CGBC’s clients ISO 9001 Quality, ISO 14001 Environmental Management System and OHSAS 18001/ISO 45001 Health & Safety management system. You will be expected to perform work in a professional manner and complete assignments on time and record all activities in CGBC’s CRM system. You shall carry out the duties in an expert and diligent manner and to the best of its ability, promptly and faithfully comply with and observe all lawful and proper requests which may be made by CGBC. All QEHS documents, letters, papers, lists of clients, memoranda or communications in writing or electronic transmission which you shall have made, shall make or cause to be made, shall have received or shall receive from CGBC or any officer thereof or which shall by any other means have come or come into his/her hands on any matters relating to the affairs or clients or any member of CGBC shall be treated as confidential and shall be and remain the property of CGBC and the consultant shall not make except for the purposes of his/her duties any copy of or extract from any such documents and further shall upon request forthwith deliver up the said documents or any of them or any copies or extracts therefrom to CGBC. • You will be expected to use your experience and training to complete your assignments in a satisfactory manner. You will be expected to pay attention to detail when completing assignments. You will be expected to keep up with current changes in EHS laws and advise CGBC clients. You will be expected to complete tasks as assigned. You will be expected to follow an organised filing system and store all work centrally. You will be expected to answer client emails correspondence within 24 hours and copy the Operations Manager on all email communications. You will be expected to maintain a project to do list/activity log for each project you are assigned as account manager. You will be expected to record all activity with clients on CGBC’s CRM system. You will be expected to attend scheduled client meetings and arrive for these meetings on time. You will be expected to follow a professional dress code and appropriate PPE at all times when required on client sites. You will be expected to be courteous to CGBC clients at all times.